Promontory Point is like a getaway to the English countryside. 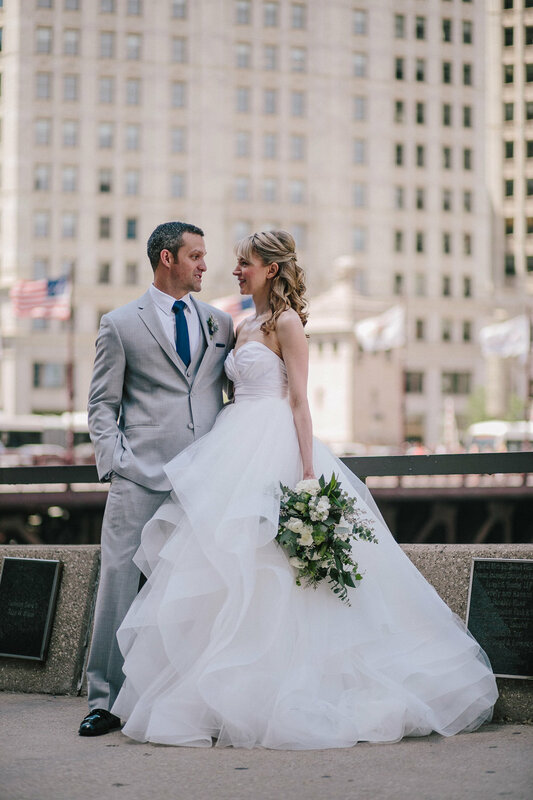 Trees, gardens, and walking paths make this lake front park the perfect place for an elegant outdoor wedding. Kristen and Tim held their ceremony in the park, with lush greenery in the decor reflecting the beauty of the natural environment. As guests arrived at the ceremony they were greeted by a welcome sign draped in eucalyptus and bay leaf garland. The ceremony took place under an arbor adorned with ivory spray roses, white garden roses, stock, and limonium and sprawling greenery. 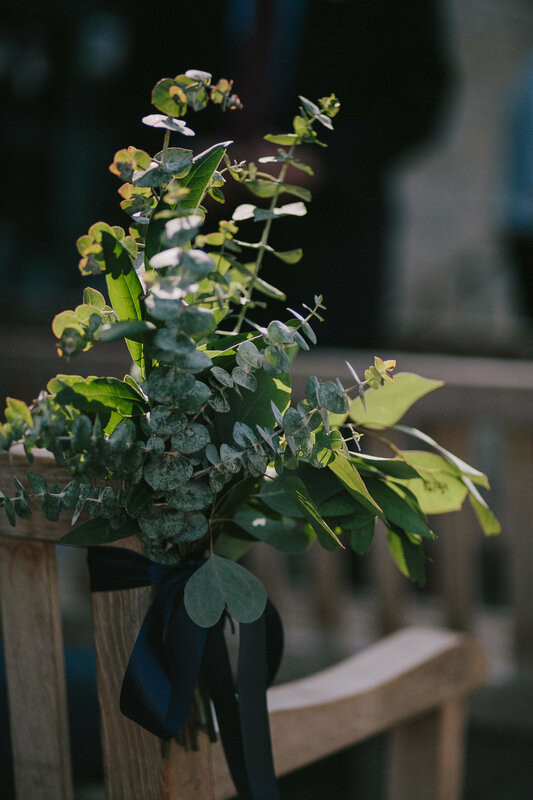 The aisle was lined with simple bundles of lemon leaf, baby blue & silver dollar eucalyptus. 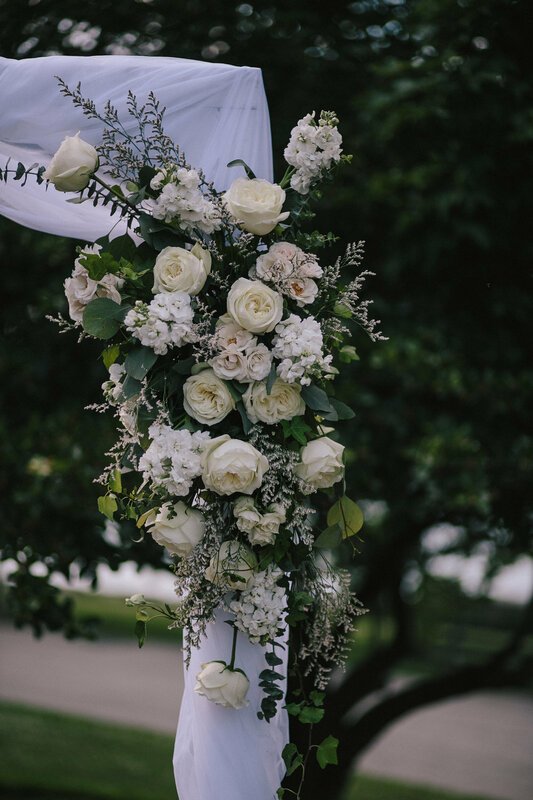 Kristen's bridal bouquet featured jasmine vine and ivy in a slight cascade with seasonal white blooms including garden roses, peonies, and ranunculus. Various shades of greenery from eucalyptus and succulents brought texture and dimension to her natural look. Tim wore a boutonniere to match- a white bloom with a succulent and greens. The bridesmaids carried bouquets similar to Kristen's, but with ivory spray roses and white stock added to accentuate the clean, classic style. The reception was held indoors, where lanterns were topped with greenery, white spray roses, and limonium. Even the cake was embellished with a single white rose and a succulent to complete the look. The rustic, classic decor of this waterfront wedding transformed this urban park into the English garden of Kristen & Tim's dreams. 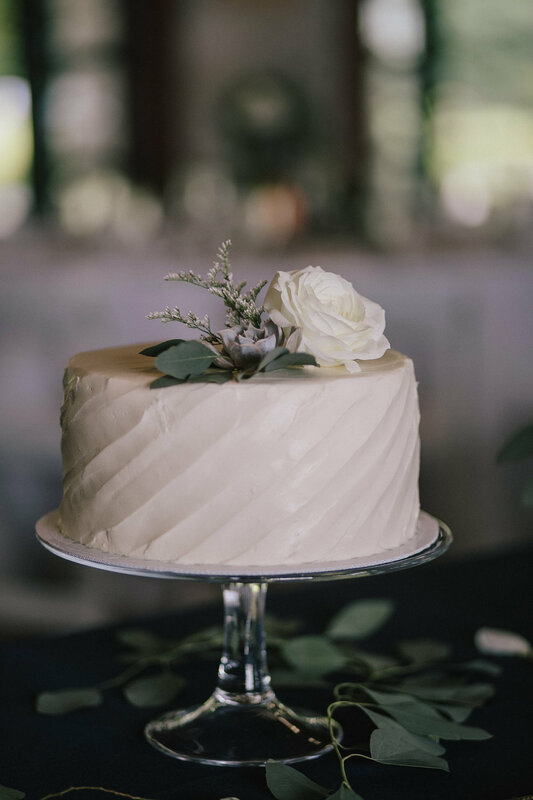 Special thanks to This Is Feeling Photography for capturing this beautiful day, and Carlene Smith from Naturally Yours Events who coordinated this flawless event!